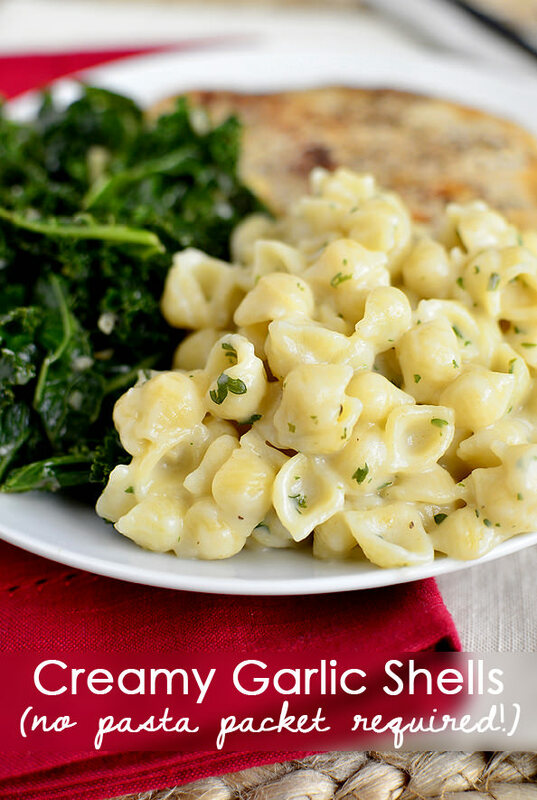 Creamy Garlic Shells are a quick and easy side dish recipe made with fridge and pantry staples. Tastes just like the store-bought package, but are funky ingredient-free! Confession: I have to physically avert my eyes every time I pass the pasta sides packets in the grocery store. You know the ones. They come in mouthwatering flavors like Creamy Chicken (a personal favorite of mine in college,) Butter & Herb (yes and yes), and Broccoli Cheddar (everybody’s favorite,) and are like, $.88 a packet. You can’t beat that with a stick! What I’d like to beat with a stick, however, is the ingredient list and nutritional information that comes along with these unfortunately delicious side dishes. Let’s just say, there are healthier options – like making it yourself! Oh yes, ditch the packet and make your own creamy, crowd-pleasing pasta side for dinner tonight like Creamy Garlic Shells. Creamy and ultra-garlicky, this simple little side dish comes together in about 15 minutes (including pasta cooking time) and the best part is that you control the ingredients that go inside. Saute fresh minced garlic in a little bit of extra virgin olive oil and butter, thicken with flour (gluten-free if you need it,) then simer with milk, chicken broth, and seasonings until thick and bubbly. 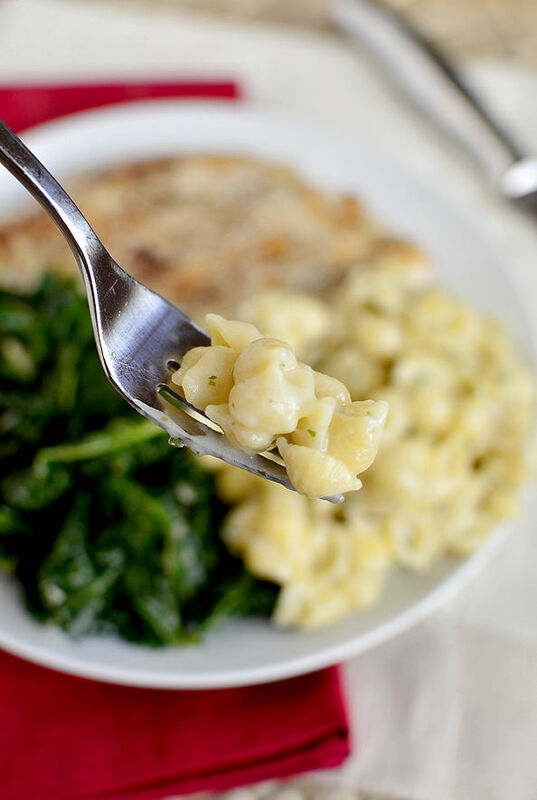 Stir in cooked pasta and you’ve got a winner of a garlic pasta side dish to pair with dinner! That is to say, this is really good. Start by cooking 8oz small pasta shells (or any small cut pasta) in salted boiling water until al dente, then drain and set aside. Let the pot cool off the heat for several minutes then return it over medium heat and melt in 1 Tablespoon each butter and extra virgin olive oil. 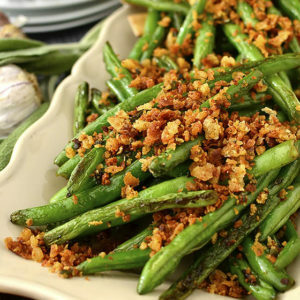 Add 2 minced garlic cloves then saute until light golden brown, 30 seconds, and then whisk in 2 Tablespoons flour and saute for another minute. Next, slowly whisk in 3/4 cup each milk (I used skim) and chicken broth, season with salt and pepper, then switch to a wooden spoon and stir until the mixture is thick and bubbly. Remove the pot from the heat then stir in 1/2 teaspoon garlic powder, 2 teaspoons dried parsley, and 1/4 cup grated parmesan cheese. Add the cooked shells back in then stir to combine. Taste and adjust salt and pepper if necessary. Scoop and serve next to the protein and vegetable of your choice, then dig in. I hope you love this easy, made-over, yummy pasta side dish recipe! Enjoy! 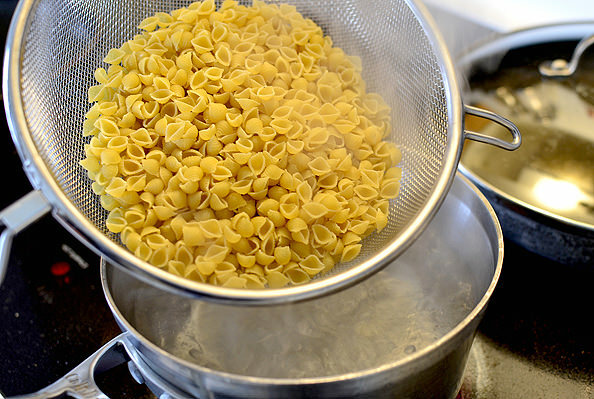 Cook pasta in a pot of salted, boiling water until al dente. Drain then set aside. Let pot cool off the heat for several minutes. Return pot to stove over medium heat then add butter and olive oil. Once melted, add garlic then saute until light golden brown, about 30 seconds, being very careful not to burn. Sprinkle in flour then whisk and saute for 1 minute. Slowly pour in chicken broth and milk while whisking until mixture is smooth. Season with salt and pepper then switch to a wooden spoon and stir constantly until mixture is thick and bubbly, 4-5 minutes. Remove pot from heat then stir in parmesan cheese, garlic powder, and parsley flakes until smooth. Add cooked pasta then stir to combine. Taste then adjust salt and pepper if necessary, and then serve. oh.my.gah. this might be dinner all weekend. Yum!! Would I be able to substitute veg broth for the kale and the cream sauce? I used to LOVE those packets when I was a kid!! sometimes nothing is better than a comforting bowl of pasta… yours looks WAY better than any packet, my dear! Guilty for eating the pasta side packets. This particular side is a favorite of mine and my husband’s…we eat it nearly every week with baked fish. Cannot wait to eat this and leave the calories and sodium behind! I was seriously deprived as a kid…I have no idea what packets you’re talking about. My sister and I used to SPLIT a packet of the chicken flavored rice as a MEAL in middle school… Apparently, it’s cheap and easy and that’s all that mattered during summer break! Dude. I ate entire packages of Creamy Chicken Lipton Noodles after noon swimteam practice nearly every day during middle school summers. My husband also made meals of those things during his bachelor days, which means we’ll probably be fighting over this side side when I make it…stat! Cream + Garlic… Anything with those in the title catches my attention right away! I used to love those oh-so-good yet oh-so-bad-for-you Lipton packets in college :) I have convinced the hubs to grill steak tomorrow night and I am sure that I’ll be making this to go on the side! I am wondering about subbing something nondairy for the milk…is that possible?? I have had to eliminate dairy for my nursing son, but I would love to do this (and many other similar dishes) . 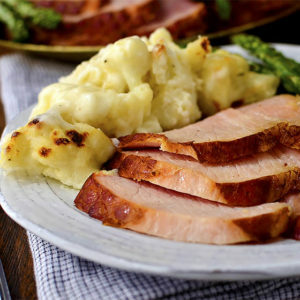 Would almond or soy or rice milk ( or something else) work without compromising the flavor of the dish too much? Thanks so much for your time! I have used almond milk in creamy sauces before and it worked out just fine. I haven’t tried it with this particular dish, but I imagine it would work! Let us know if you give it a try! I use unsweetened coconut milk. The type in the cartons. It works great! I like it better than almond milk when substituting for regular milk. BTW love this recipe. I just mixed the sauce with rice and it is equally delicious! I am dairy free my whole life and I am here to tell you coconut milk is way better than any of those. not like crack open a coconut and squirt juice everywhere kind of thing but go to the same spot as you get your almond milk and look for the alternative coconut milk. it also comes in cans, from places like thailand where the food prep standards are really high. sometimes I prefer the canned version for cooking and the tetrapack version just for drinking. Looks incredibly yummy!! Do you have to massage the kale for this recipe or does the steaming take care of that? Nope, the sauteing and steaming takes care of it! I’m dying right now for that plate. I am pregnant and on semi-bedrest, and tonight I was in so much pain I had to get drive thru for dinner (which grosses me out like you wouldn’t believe) for the kids and me (hubby is out of town). And now all I can think about is that plate of deliciousness you just planted in my head. I need something wonderful to replace the super gross El Pollo Loco that I ingested for dinner. Blech. I’m more sorry with every minute that passes. 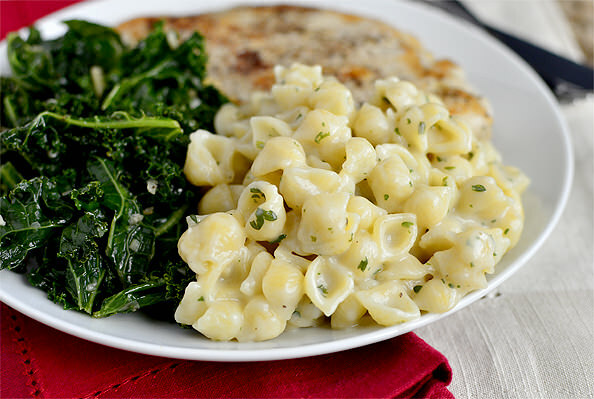 Have you tried the baby kale from Costco to make that dish? I wonder if it’s too tender. I finally made it tonight! My compromise was a rotisserie chicken and French bread from the grocery store (when I would normally make my own for both), and I made the noodles. Two pounds of noodles (I have 5 young kids we call the locusts because they devour everything in sight). They were yummy. The kids LOVED them. They’ve never had the packets, but now they can enjoy the deliciousness. They call them creamy noodles. It just so happens that I have all the ingredients on hand to make these!! yay!! Hahahaha! Your final pic of this amazing dish is an upside down peace sign!! This whole meal looks delish! 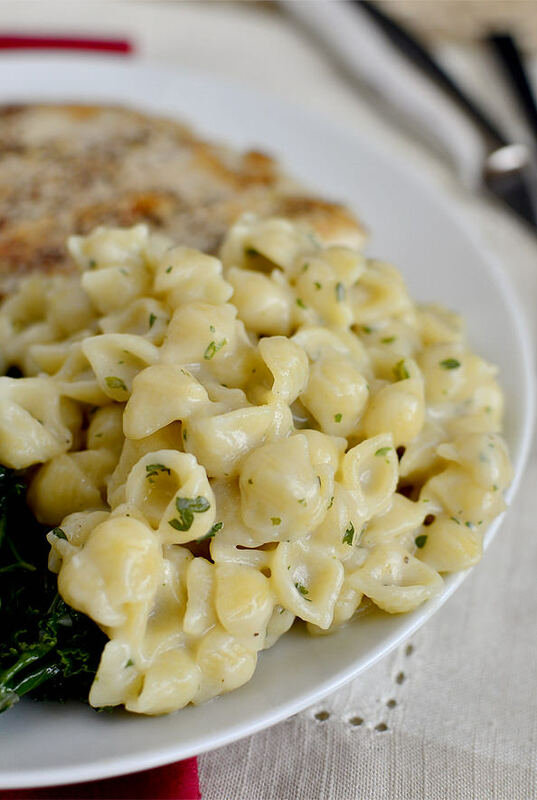 Those creamy garlic shells are calling my name! This is my favorite way to prepare kale. It’s quick and easy. I’ve even eliminated the chicken broth and steam it in water. Does Ben have any interest in switching places with me at dinner, like, for a week or so, so that I can eat these delicious meals you make? He is SO lucky! Thank you so much for the sweet feedback, Brittany! I really appreciate it! Yum, yum, YUM! So simple! Can’t wait to try it out!!! Love your blog! Your recipes look absolutely delicious!! I am brand new to your site and know I will be back!! I can’t wait to try it! Could you please tell me more about Kale? What do you look for when you buy it? My husband does the grocery shopping and most of the cooking, since I’m physically disabled. I appreciate your help. Looking forward to spending time here at your wonderful blog! Thanks so much, Donna, glad to have you! This post reminds me of a question I have had for a while. You are usually pretty specific about switching to a wooden spoon in a number of your recipes. Is there something special about the wooden spoon verses a plastic scraper or just sticking with the whisk? Oh, my college roommate & I used to LOVE the Lipton pasta sides! There was a sun-dried tomato one that was our favorite…I might have to try and recreate that one myself! I don’t buy them anymore because of all the chemicals,preservatives, etc. in them. I just googled hydrolized soy protein. YIKES!!!! I’m not sure about Kristin, but I have heard that metal spoons can have a chemical reaction with some ingredients. Also, they conduct heat so not only is it easier to hold a wooden spoon when you are making a sauce, but it won’t mess with the temp of whatever you are cooking. Hope that helped! I love those pasta packets, too. Why are they so good but so bad? I will have to try this! Just discovered your site and love it. I used to have these pasta/rice side dishes 2 or 3 times a month. Have decided not to eat any more of these processed foods (last one I made was a month ago). So happy you posted this recipe I will be making it next week. I used to be obsessed with late night cheesy shells in the college days. This is taking me back…I definitely need to make this! These look so good! My kids will go nuts for them! 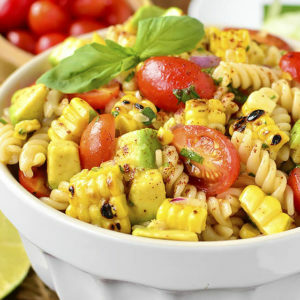 You couldn’t be more right about those yummy pasta sides!I wish I could go back to the days when I had no idea how unhealthy all of that stuff was. Ingnorance really is bliss. But I’d trade those processed nuggest of goodness for my health any day :) Well… most days. JUST made this and it is SO yummy!! Thank you, thank you for sharing! I’m paring the pasta with some chicken and pork italian sausages and broccoli. That pasta definitely looks the “ish” haha :) I love your writing, it’s very relatable, and the dish frankly looks irresistible! The hydrolyzed soy protein that you saw on the ingredient list is a fancy way of saying there is MSG in it to make it taste better. Glad to see you have a better homemade alternative!!! Looks yummy!! OMG this was sooo good made with rigatoni since that is the pasta I had on hand! Seeing as I’m amongst like-minded people I feel I can admit that I also suffer an addiction to packet pasta. I reckon this would hit the spot. Might make some tonight. Mmmmm! Made this last night. Great recipe! I doubled the sauce because I added chopped chicked and I used 2 cups(uncooked) penne since I didn’t have the shells. We love garlic so I used 6 cloves minced. My husband and I both loved it. mmmmm! I admit it, I love those little pasta sides packets too. They just pull me in! haha. But however, like all things homemade is always better! yummy!! Oh yum, your pasta looks absolutely delicious! I have been wanting to try a homemade version of those box sides for a while. I agree they are so tasty, but the ingredients are scary! 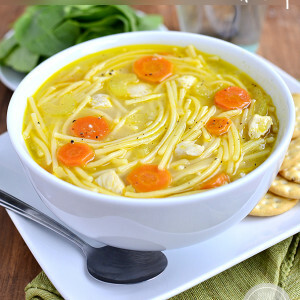 I loved your broccoli orzo (the kids requested more cheese lol), and can’t wait to try this too! 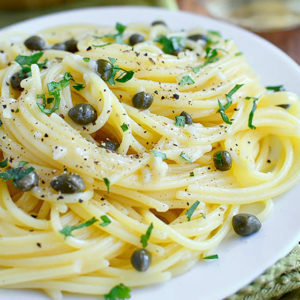 This pasta looks fantastic. I only make pasta roni when my husband is out of town because my kids and I like it with salmon, which he hates. I have wanted to figure out a “real” version for a while, but when I am solo is not the right time for that. Now I can make your version and not have to figure it out on my own. It looks so tasty I might just have to make it this week and serve with something other than salmon instead of waiting for him to go out of town. I just made this. My husband and I both loved it. I’ll be making it again this week for a kid-friendly meal.